Be our guest at one of our 7 Springs Mountain Villa rental units! Seven Springs offers the perfect location for your family or group getaway to the mountains in the summer or winter. Plan your winter or summer vacation, retreat, family reunion, golf outing or relaxing getaway now! No matter what the size of your group, we have the lodging for you! The Mt. Villas townhouses 5-1 and 5-2 offer top notch comfortable rental accommodations with all the amenities of home! No pull out sleep sofas! No sharing a full size bed either! Bedding is either king, queen or twin size for sleeping comfort. For larger groups choose our 4 BR townhouse (sleeps 12) or 5 BR townhouse (sleeps 15). It's your choice! For really big groups, family reunions, golf outings, etc.., choose both! These townhouses are side by side - right next to each other. For smaller groups, choose our 3BR condo that sleeps 8 - vrbo 631480. All three properties are conveniently located less than a mile from the Seven Springs main gate in the Seven Springs Mountain Villa community near the outdoor pool and golf course. New - We are always updating and replacing items - new kitchen pots and pans and new furniture and bedding. Once you are parked and settled, hop on the FREE shuttle to the lodge, slopes, spa, shops, etc... Shuttle service runs year round to the lodge. In the winter months, the shuttle runs 24/7 - every 15 minutes on weekends and is on call for pickup during the week. Looking for a location for your golf getaway? We are located at the 7 Springs golf course. No pets and no smoking. Must be 21 years of age with valid government ID/drivers license to rent. Two night minimum for non holiday weekends. Linens and towels and included for all rentals. High speed WiFi included. Gather your group and email us today for availability and pricing. Note: Pricing is subject to change. Minimum rates apply. First 2 night minimum on any rental. Please contact us to confirm pricing. Note: VRBO now collects and remits all PA taxes. Call or email today to book your stay!!!! Great year round vacation location for skiing, swimming, enjoying numerous festivals, golfing, sight seeing, crafting, or just relaxing with the family. Complete warmth throughout in the townhouse! These townhouses are the ONLY properties in the Mt. Villas with a separate heating unit in each master bedroom that are controlled individually for complete warmth and comfort in the property. 5 BR - Four full baths. Full bath on every bedroom level! Two on the middle level. Located in the Mountain Villas at 7 Springs Ski Resort. Free shuttle provided to resort. Park your car and ride the shuttle! 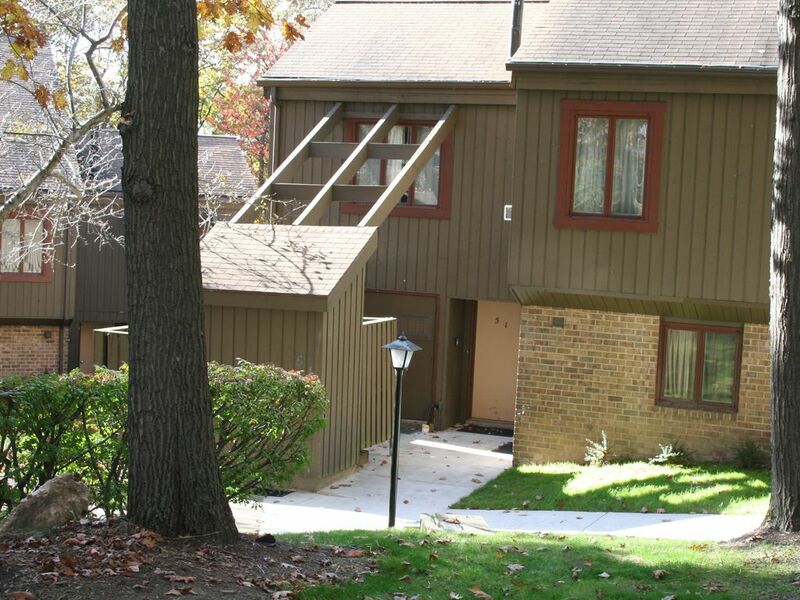 We are located within steps of the Seven Springs Golf Course and clubhouse! Golf course can be seen from townhouse. Warm gas heat! 3 systems - whole house PLUS supplemental unit for lower level family room. AND NEW and unique to only our properties: Additional supplemental heat for master bedrooms. No need to bring sheets - we provide them! Park in front of unit. Plenty of parking available on property! No need to bring towels - we provide them! 5 BR townhouse - Full size refrigerator in the kitchen plus mini fridge in lower level living area for additional beverages. We provide hand soaps, dishwasher detergent, dish soap, laundry detergent, toilet paper and paper towels. Newly renovated kitchen with brand new appliances, counters, under counter lighting, and tile flooring. Full array of cookware, pots and pans for in house meal preparation. Take the free shuttle to the slopes! The shuttle stop is right in front of the townhouses. We are located at the Seven Springs golf course! We are located on the grounds of the Seven Springs Golf Course and outdoor pool. The pool is FREE to Mt. Villa guests in the summer. Year round, you can ride the FREE Mt.Villa shuttle to the lodge - less than a mile away.